The choice of sanitation technology in humanitarian crisis is based on various factors including the terrain, social and cultural norms and agency experience. There is the continued need for humanitarian response mechanisms to factor the environmental impact and sustainability of the technologies used in the provision of safe water supply and sanitation to affected communities. 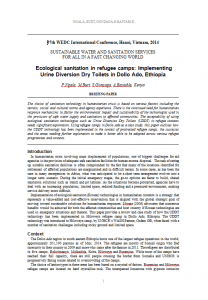 The acceptability of using ecological sanitation technologies such as Urine Diversion Dry Toilets (UDDT) in refugee contexts needs significant exploration. 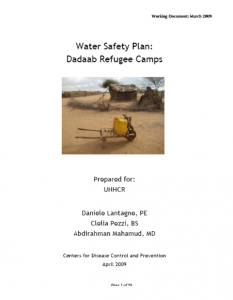 Using refugee camps in Dollo Ado as a case study, this paper outlines how the UDDT technology has been implemented in the context of protracted refugee camps, the successes and the areas needing further exploration to make it better able to be adopted across various refugee programmes and contexts. Tags: Excreta / Urine ReUse, Excreta Composting, Excreta Management, and Excreta Treatment. Locations: Dollo Ado and Ethiopia. Organisations: OXFAM GB, UNHCR, and WEDC. Categories: WASH Research Documents. Tags: Water Quality Testing and Surveillance, Water Safety Plans, and Water Supply. Locations: Africa, Africa, Dadaab, East and Horn of Africa, East and Horn of Africa, and Kenya. Languages: English and English. DatabaseDocTypes: Water Safety Plans. Categories: WASH Reference Documents and WASH Reference Documents.